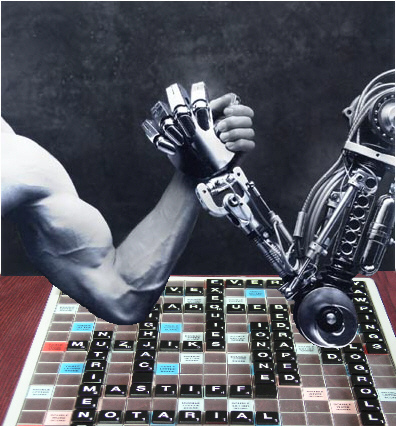 Can computers compete with us, human programmers, in the near future? The short answer is yes – if computers will gain enough processing power, become intelligent, could effectively interact with humans, build useful programs and… still be interested to serve humans. Computers take over more and more people jobs and areas considered exclusively human. Deep Blue beat the human best chess champion Garry Kasparov, it is not possible to win checkers against computers, they create drugs, carry 70 % of foreign currency trades and will do 50% of stock trades in 2010. But to become better than a human programmer, a computer should compete with very powerful processing machine – our brains. Human brain contains around 100 billion neurons (nerve cells). Output of one neuron can be transmitted to tens of thousands of other neurons via tiny structures called synapses. Neurons can produce brief spikes of voltage in their outer membranes – hundreds of electrical pulses per second. The electrical signal travels along specialized extension called axon and converted to a chemical one. Chemical signal is transmitted across the synapse, to the next neuron using small molecules called neurotransmitters (such as dopamine, serotonin and acetylcholine). 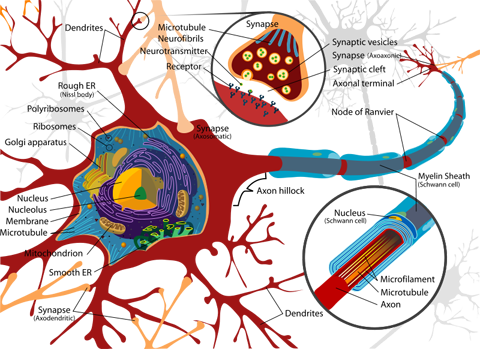 There are other possible information couriers: glial cells (10 times as common as neurons), other kinds of signaling mechanisms between cells (gases and peptides), and the biochemical cascades that take place inside cells. Our brains form a million new connections for every second of our lives. The pattern and strength of the connections is constantly changing and no two brains are alike. 100 different neural networks in the human brain are performing specialized function: vision, smell, goal setting, speech, prediction, and hundreds of other tasks. Despite their different functions, these systems work together seamlessly and it is surprising that the brain coordinates its systems so rapidly. The slow speed of spikes (they travel about one foot per second in axons) is one hundred-millionth the speed of signal transmission in digital computers. Yet a human can recognize a friend almost instantaneously, while digital computers are slow—and usually unsuccessful—at face recognition. The brain is a parallel processor, running many operations at the same time. Brains are amazingly fast at comparing results of processing and deciding upon. An animal running must go left or right around a tree; it cannot do both. There is no special anatomical location in the brain where information from all the different systems converges. The specialized areas all interconnect with one another, forming a network of parallel and recurring links. Somehow, our integrated image of the world emerges from this complex network of brain structures. Hans Moravec estimated that computer processing power should be around 100 million MIPS (100 TFLOPS) to match human brains. Ray Kurzweil estimation is 10,000 TFLOPS. Today super computers exceed minimal estimation: Blue Gene has 360 TFLOPS, MDGRAPE-3 (4,808 processors) achieves more than one PetaFLOP (1,000 TFLOPS). Distributed computing enables another approach to higher performance: BOINC has 557 TFLOPS (435,000 computers), Google cluster (in 2005) had roughly around 900 TFLOPS (450,000 machines x 2,000 MFLOPS). Ordinary processors have better and better performance: Intel 8080 had 0.5 MFLOPS in 1974, Pentium III had 1,500 MFLOPS in 1999, today Sony Playstation 3 Cell processor achieve around 230,000 MFLOPS. New Intel Polaris (80-core chip) prototype processor showed 1.2 TFLOPS. Based on Moore’s Law and present trends affordable computer could achieve human brain processing power by 2020. 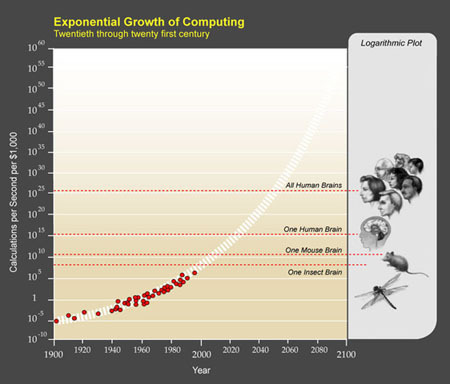 We achieve one Human Brain capability (2 * 1016 cps or 10 PetaFLOPS) for $1,000 around the year 2023. We achieve one Human Brain capability (2 * 1016 cps) for one cent around the year 2037. We achieve one Human Race capability (2 * 1026 cps) for $1,000 around the year 2049. We achieve one Human Race capability (2 * 1026 cps) for one cent around the year 2059. 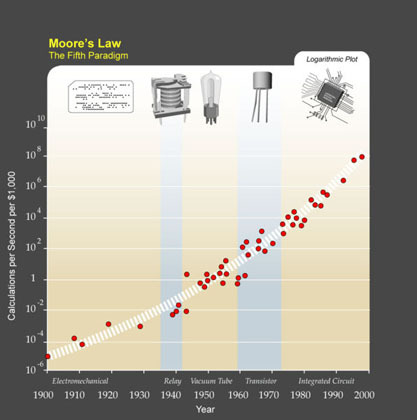 This estimation relies on generalized interpretation of Moore’s law, with assumption that other technologies could overcome limitations of integrated semiconductor complexity. And there are some hopes for this. A quantum computer system of 500 qubits could be the equivalent of performing some operations on a classical super computer with ~10150 separate processors. Molecular computers could do massive parallel processing – in 2002 a programmable molecular computing machine composed of enzymes and DNA molecules performed 330 TFLOPS. Programmer’s brain has hundred billions neurons and one hundred trillion neural connections each operating at few hundred analog calculations per second. However, most of processing is dedicated to life support functions, not information processing. Human neural networks are much slower than modern digital processors, but have an amazing efficiency for parallel processing, aggregating and deciding upon results. Probably, mass computers will achieve comparable processing power by the year 2020. But does it automatically mean that they can compete with human programmers? There are technical challenges like improving computers parallel and distributed processing and algorithms. But the main challenge is that computers should become intelligent to write programs – understand problem space, people and come up with solutions. This is a topic of the next part. Weekly Digest: Computers vs. Humans, Thoughts: Remember or Forget? Fair Compensation for Programmers. Is it possible? Very nice article, thank you for sharing AI ideeas.